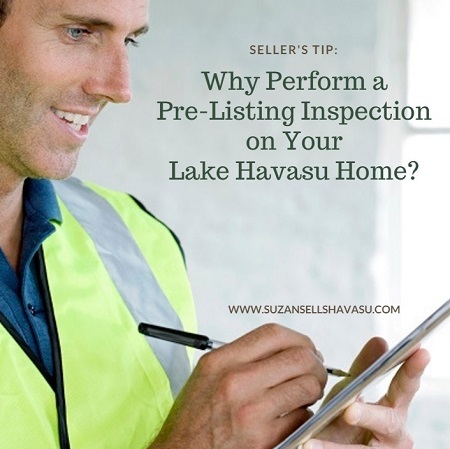 Why Perform a Pre-Listing Inspection on Your Lake Havasu Home? A home inspection can either make or break any Lake Havasu real estate deal. Too many problems may cause a Buyer to say "no thanks". It could also bring in a lower offer or cause delays while the Seller makes requested repairs to seal the deal. Help create a smoother transaction by performing a pre-listing inspection on your Lake Havasu home instead. A pre-listing inspection points out what is great with your Lake Havasu home as well as what needs to be repaired or replaced. This helps you and your Lake Havasu real estate agent decide on an appropriate list price. You can either sell it "as is" or go ahead and make the changes needed before you put your home on the market. Studies show that Buyers over-estimate the cost of repairs by as much as 100%. When they see things that need to be fixed, they start adding up those costs in their heads. Then, they start deducting those costs from the list price. Chances for a higher offer increase when you make these repairs yourself before a Buyer ever sees them. Sometimes, spending a few hundred on updates, repairs or replacement translates into a much higher asking price than expected, too. Once the repairs/updates are made, you can tout them as "recently updated/upgraded" items. Such as, "new roof", "recently updated appliances" or "brand new swimming pool pump". This signals to the Buyer that you have taken care to maintain the property. That can be very appealing. Talk to your Lake Havasu real estate agent. They may be able to recommend a reputable home inspector to perform your pre-listing inspection. They also know what kinds of questions to ask on your behalf to help explain potential issues. You hired them for their knowledge and expertise. Make sure you utilize both the their maximum potential.